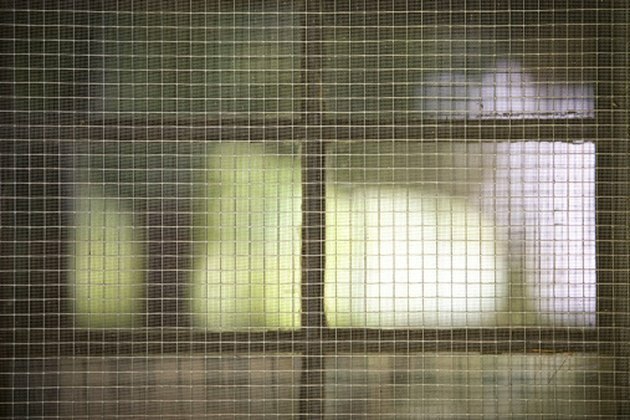 Window screens are essential to have on your windows. They allow you to enjoy the freshness of clean air without inviting bugs or floating debris into your home. They also prevent strong gusts of wind from causing papers or other light items to float off outside. For screens to work most efficiently, they must have a perfect, snug fit to the window frame. If there are any gaps, no matter how small, they will be responsible for your window screen falling. An improperly installed window screen can't do its job. Open your glass window frame by lifting it or pulling it toward you, depending on the type of window you have. Locate any gaps between the screen and the window frame. Visit the hardware store and purchase two metal curtain rod wall hooks. You will make them into clamps. Ask the appropriate department in the store to saw off the hooks for you. Now you should just have two small metal rectangles with holes for screws. Spray paint them white with paint designed for metal. Allow them to dry fully. As they're drying, locate two screws that are at the top on either side of the window frame. Unscrew them with your screwdriver, pocketing the screws. Hold horizontally one metal rectangle made from your curtain rod wall hooks. Line up one of its holes with one of the holes from the screws you just removed. The metal rectangle should point inwards, the bulk of the metal pressed against the screen, keeping it from falling. Repeat with the other metal rectangle. You've now created two clamps to keep your screen in place.